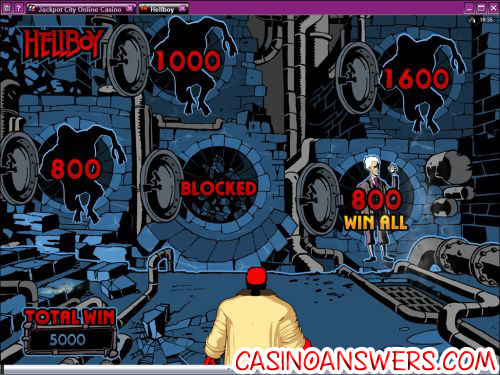 Hellboy Video Slot Guide & Review - Casino Answers! Hellboy is a 5-reel, 20-line video slot developed by Microgaming. It features wild substitutes, scatter wins, free spins, a gamble feature and a bonus game. You can play the Hellboy video slot at Jackpot City Casino and Nostalgia Casino. Play at this years #1 online casino for United States - Slots.LV. The Hellboy video slot is based on the popular Hellboy comic series from Dark Horse Comics, created by Mike Mignola. As most people know, it also spawned two movies that were both very successful at the box office. The Hellboy character is a demon with superpowers including superhuman strength, fast healing, long life, the ability to speak to the dead and an Invulnerable Right Hand of Doom. 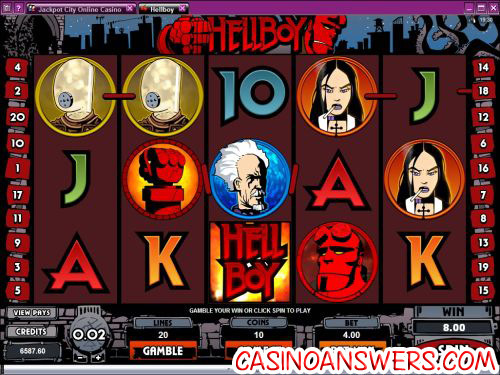 The Hellboy video slot features comic book style graphics, which very much add to the intended feel of the slot machine. The game uses various shades of red, which is what you can expect from a game called “Hellboy.” Symbols in the Hellboy comic book slot are the Hellboy logo (wild symbol), Invulnerable Right Hand of Doom (scatter symbol), Hellboy, Liz Sherman, Abe Sapien, Johann Kraus and Professor Trevor Bruttenholm. The Hellboy slot also uses Ace, King, Queen, Jack and Ten card symbols. If five Hellboy logo wild symbols appear on a selected payline, you will win the Hellboy top fixed jackpot of 10,000X your line bet. The wild symbol will substitute for any symbol except for the scatter symbol to complete a winning combination. Any winning combinations using the wild symbol will be doubled. Other significant jackpots on the Hellboy slot machine are the Hellboy symbol at 5000X, Liz Sherman at 2000X and Abe Sapien at 1000X. After any win in Hellboy, you can click the “Gamble” button to double or quadruple your win. You can either predict the colour of the facedown card to double your win or the suit to quadruple it. You may opt-out of the Gamble feature at any time by hitting the “Collect” button. The Gamble feature will play out until you hit the casino’s gambling limit. The Hellboy slot has a randomly triggered free spins mode called “Super Mode.” In the Super Mode feature, you will be awarded 10 free spins. Up to 3 wild positions are randomly awarded and held in place for the duration of the feature. If the Super Mode and Underworld bonus game are triggered at the same time, the bonus game will play out first. The bonus game cannot be triggered during Super Mode. Free spins cannot be re-triggered. The Hellboy slot machine’s scatter symbol is the Invulnerable Right Hand of Doom symbol. All you need is two of these symbols for them to payout 2X your total bet. Scatter wins do not have to be on a selected payline to payout. Scatter wins are multiplied by the total bet staked. Scatter wins will be added to your regular payline wins. Three or more Scattered Right Hand of Doom symbols will trigger Hellboy’s Underworld bonus game. In the bonus game, your mission is to find the guarded Hidden Relic of Power. You must travel through the Underworld and battle dangerous creatures to win prizes. Finding team members will win you all of the prizes for that level. If you come across a tunnel, the bonus game will end. You must complete all 4 levels to reach the Chamber of Fire and claim the Relic of Power. Relics of Power reward you with additional prizes. You have one pick per level. One interesting feature on the Hellboy video slot is the ability to click on a symbol on the reels and be able to view its payouts without viewing the paytable itself. This comes in handy a lot, and is a nice inclusion on the part of Microgaming. All wins pay left to right, except for scatter wins which pay any. All wins are multiplied the coins staked per line with the exception of scatter wins. Only the highest win is paid per selected line. Bonus wins are multiplied by the total bet. To speed up the play of the Hellboy comic slot, turn on “QuickSpin” under the Options menu. Hit the “Expert” button to enable the autoplay mode on the Hellboy slot machine. In the autoplay options, you can set the number of spins between 5 and 500 as well as to stop if a win exceeds or equals from $100 to $9999. Autoplay will stop if a feature is triggered. You can cancel the autoplay mode at any time. Hellboy is one of the new additions to the vast Microgaming game library and also one of the best. With all of those special features including a bonus game, a free spins feature, a gamble feature and the exception 10,000X top jackpot, Hellboy makes for an spectacular video slot whether you are familiar with the Hellboy character or not. To play Hellboy as well as nearly 400 other games, visit Jackpot City Casino. Are US players able to play the Hellboy video slot? Unfortunately, Microgaming casinos are not allowing US players to sign up at their casinos at this time. For some excellent alternatives, try playing the interactive iSlots at This is Vegas Casino. Is there an instant play flash version of the Hellboy slot? Jackpot City Casino offers a no-download Flash casino in addition to the download version. If you have any problems playing the Hellboy Flash game in your browser, make sure you have the latest version of Adobe Flash Player installed on your computer. Are there any comic book slots online?